Many question answering systems and related components have been developed in recent years. 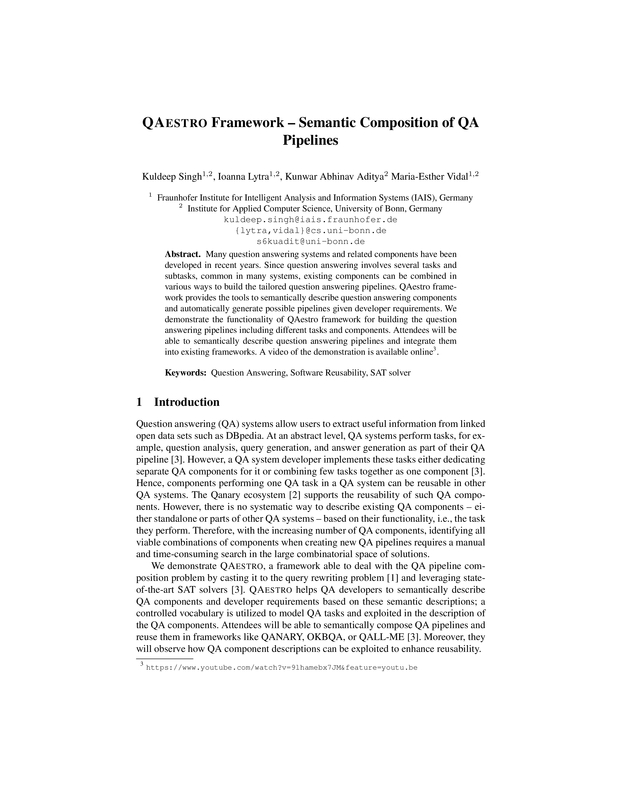 Since question answering involves several tasks and subtasks, common in many systems, existing components can be combined in various ways to build the tailored question answering pipelines. QAestro provides the tools to semantically describe question answering components and automatically generate possible pipelines given developer requirements. We demonstrate the functionality of QAestro framework for building the question answering pipelines including different tasks and components. Attendees will be able to semantically describe question answering pipelines and integrate them into existing frameworks. A video of the demonstration is available online (https://www.youtube.com/watch?v=9lhamebx7JM&feature=youtu.be).